The average cost of medical treatment for motorcycle accident related injuries is a staggering $33,000. Unfortunately, many times, these costs can be much higher and can even reach hundreds of thousands of dollars. Additionally, this does not take into account time missed from work, rehabilitation, and compensation for pain and suffering. All vehicles on Massachusetts roads are required by law to carry minimum insurance of $20,000 per person and $40,000 per accident. This is mandatory and there is no way around it. Most drivers adhere to this legal requirement and carry insurance. Sadly, some do not. Accident victims and their families face enough difficult challenges without the additional burdens of an uninsured at-fault driver. If you or a loved one has been injured by an uninsured driver, or a driver with inadequate insurance, you can be left holding the bills. Do not panic, however, as there are steps that can be taken. If you or a loved one has sustained injuries or was wrongfully killed after a motorcycle accident caused by a negligent uninsured driver, prompt action is imperative. The experienced Boston motorcycle accident lawyers at Bellotti Law Group, P.C. have helped numerous victims over the years cover their medical and rehabilitation bills, obtain lost employment wages, and compensation for their pain and suffering, and other damages following a motorcycle accident with an uninsured driver. Help is available, but calling our experienced and skilled attorneys right away is critical to your success. Contact our Boston, Cambridge, or Quincy office today at 617-225-2100 for a free consultation. If another negligent, at-fault driver was uninsured at the time of your motorcycle accident, contact an experienced Boston motorcycle accident attorney at Bellotti Law Group, P.C. to protect your rights. If you have motorcycle insurance in Massachusetts, by law, you have at least $20,000 in coverage to cover your pain and suffering and lost employment wages and up to an additional $8,000 in PIP ("Personal Injury Protection") coverage for medical bills and lost wages. Uninsured motorist coverage is not mandatory in Massachusetts. Nonetheless, our Boston motorcycle accident lawyers recommend all motorcyclists to purchase it as part of their policy. This is usually a very affordable option and can be immensely helpful in protecting you down the line. Effective immediately after uninsured motorist coverage is added to your policy, you and members of your household are covered if injured following a motorcycle accident with an uninsured motorist. Coverage up to $500,000 can be purchased in Massachusetts. The Insurance Research Council reports that an alarming one-in-ten drivers in Massachusetts are operating their cars and truck without insurance. This number may be closer to 1-in-7 as the economy gets more challenging and drivers are negligently and criminally forgoing mandatory insurance. Basically, your risk of being involved in an accident with an uninsured motorist is higher than you think! If you have been injured after a motorcycle accident with an uninsured motorist, you may first be able to establish a claim against the personal assets of the at-fault driver. Many times, however, if a driver cannot afford insurance, he likely does not have any other assets. Thus, our motorcycle accident attorneys will also likely pursue an insurance claim against any insurance available on other vehicles in the liable motorist's household. Another viable option is filing a claim against your own insurance company for uninsured coverage under your policy. In any event, we will examine each and every possibility to get you the compensation you deserve. There is no doubt that if you must file a claim against your own insurance company to make up for an uninsured driver, they will not be sympathetic to your plight. Our lawyers have many years of experience negotiating valuable settlements with difficult insurance agents and policies. We will get you the best compensation package available and will fight for your every right. 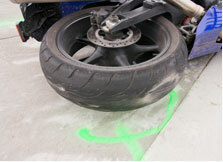 Contact our Boston, Cambridge, or Quincy motorcycle accident lawyers today at 617-225-2100 for a free consultation. Our passion is helping our clients get their lives back on track and enjoying each day.